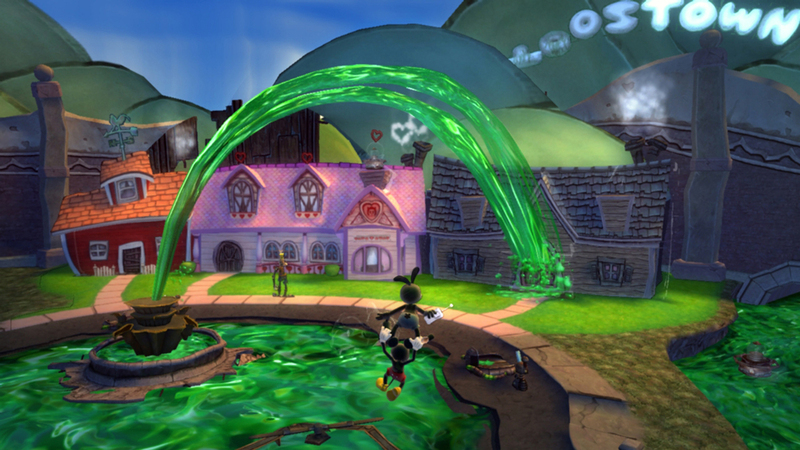 Disney Epic Mickey had the makings of a great game: one of the most beloved fictional characters of all time, one of the most respected developers in the industry, and a story that incorporated some of Disney's forgotten greats with a fun gameplay mechanic. But it also had a big problem: the camera. Forget the boss fights, the camera was the player's worst enemy in Disney Epic Mickey, and it caused the game to fall far short of its potential. So naturally, the first thing I wanted to know when I played Disney Epic Mickey 2: The Power of Two on the show floor was whether or not the camera had been fixed. Let's just get the bad news out of the way: it hasn't. The player still doesn't have control over the camera, and it gets in the way, rotating wildly out of control. Sometimes it's mildly annoying, but during chaotic boss fights, it's a cause of cheap and needless deaths, which can be very frustrating. That said, Epic Mickey 2 has plenty of reasons to overlook these shortcomings. I played the 360 version, which looked great, and aside from the wonky camera, the platforming and painting controls are completely intuitive. Once again, Mickey has control over paint and thinner, and can use them to mold his surroundings-paint adds platforms, walls, treasure chests, and other goodies, while thinner removes them, revealing secret pathways or just creating mischief. This time around, however, the changes you make to an environment stay that way after you leave. 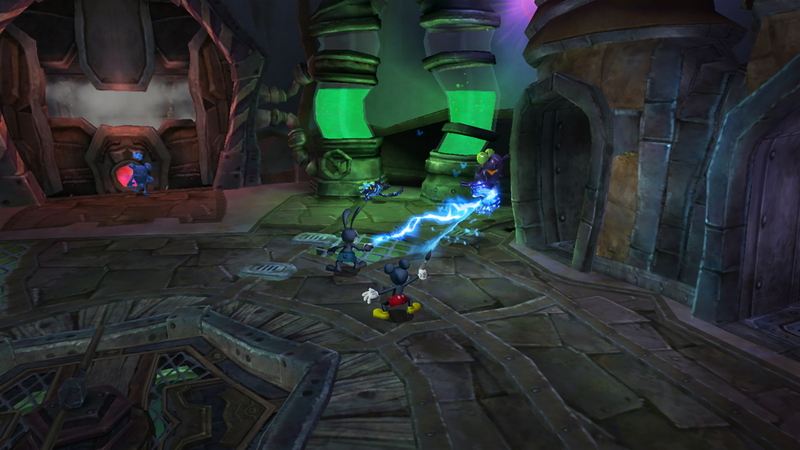 It was a little disappointing to constantly have my modifications disappear in Epic Mickey, and the permanent changes are a major improvement. As the title suggests, Mickey Mouse isn't the only hero in the game. 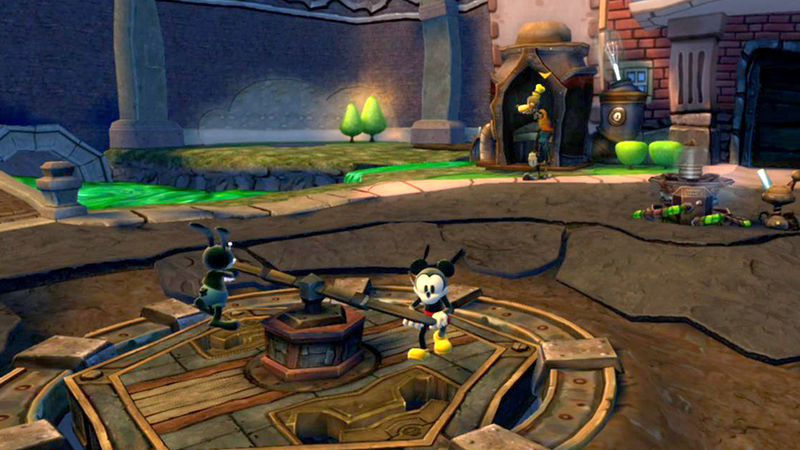 For the first time, Oswald the Lucky Rabbit is a playable character usable in two-player co-op. Oswald doesn't dual-wield paintbrushes, but has his own set of powers. His remote control can reprogram certain electrical items, and he can shoot electricity that enhances Mickey's paint, meaning their powers are greater combined. He can also use his ears as a helicopter to carry himself and Mickey, making him reminiscent of Tails in Sonic the Hedgehog 2. I tried out the cooperative play with The Escapist's Susan Arendt, and after we slapped each other into walls and off platforms for a few minutes, we began to work together. We traversed one of the game's delightful 2D platforming sections, which return from Epic Mickey, and made our way into a boss fight that takes place later in the game. Unfortunately, the lack of camera control quickly led to chaos. It took a bit of struggling and falling into pits of lava before we were able to find our groove, working together to conquer the mechanical monster. The return of the problematic camera in Disney Epic Mickey 2 is disappointing, but that doesn't mean this game should be written off. The characters are charming, the co-op is fun, and being able to erase entire buildings to look for collectables is addictive. It's flawed, but I still want more. 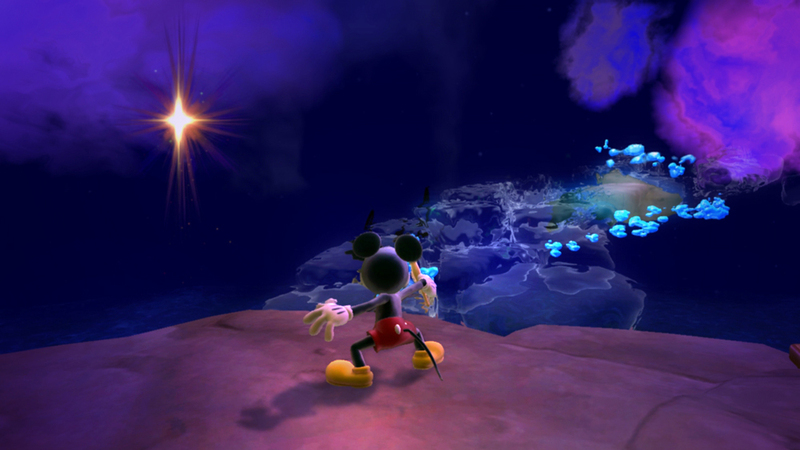 And as someone who ultimately enjoyed Epic Mickey in spite of its problems, I can look past the camera. But I shouldn't have to, and a lot of gamers won't want to. See all our coverage directly from the E3 2012 show floor.